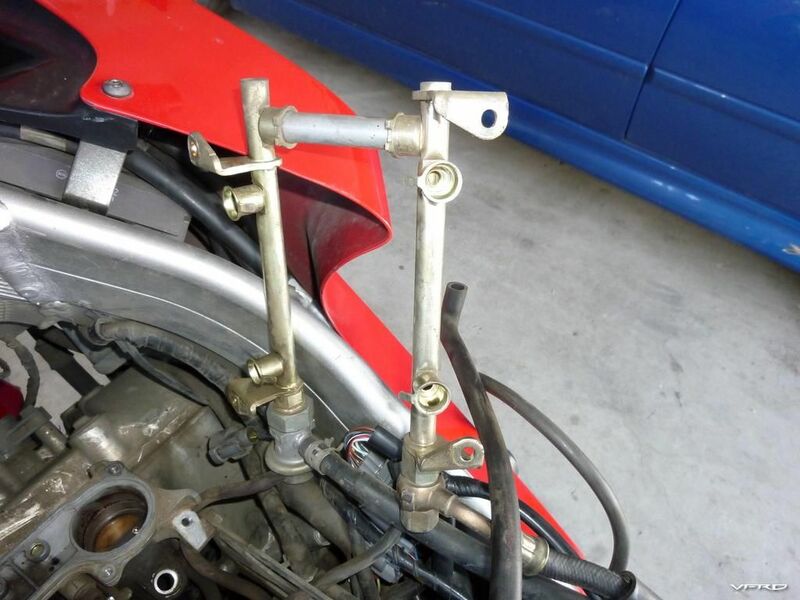 This is a guide on having your fuel injectors on your VFR800 cleaned. It is specific to the 6th-generation VTEC model, but should be almost identical on a 5th-generation VFR. I will build this post up in stages, starting with just my videos and the increase in flow rates from the cleaning, followed later by the pictures. So let's get into it. The first thing we need to do is remove the fuel tank. Best to get this sucker as empty as you possibly can before removal, as when you loosen the banjo bolt from the fuel pump and the fuel return line whatever is in the tank is going to come out as fast as it can. Next up is removal of the airbox, which has been covered many times before so we won't repeat it. We're really getting into it when we remove the fuel rail. You need to remove the injector electrical plugs first. The "latch" on these connectors is on the under-side. Once you have done that, you can remove the four 8mm bolts and gently and slowly lift the fuel rail away. If an injector comes with it, hold the injector down while you gently lift the fuel rail off it. It will pop slightly as it slips past the O-ring on the injector. Removing the fuel rail. Red first, green second! The fuel rail itself is made up of a few pieces. Don't twist it or wiggle it about or you may damage the O-rings keeping the pieces sealed under fuel pressure. The fuel rail is essentially two pieces joined together by a pipe. The pipe is only secure by O-rings, so unless you want to replace those too, don't go yanking the fuel rail around and damaging them! 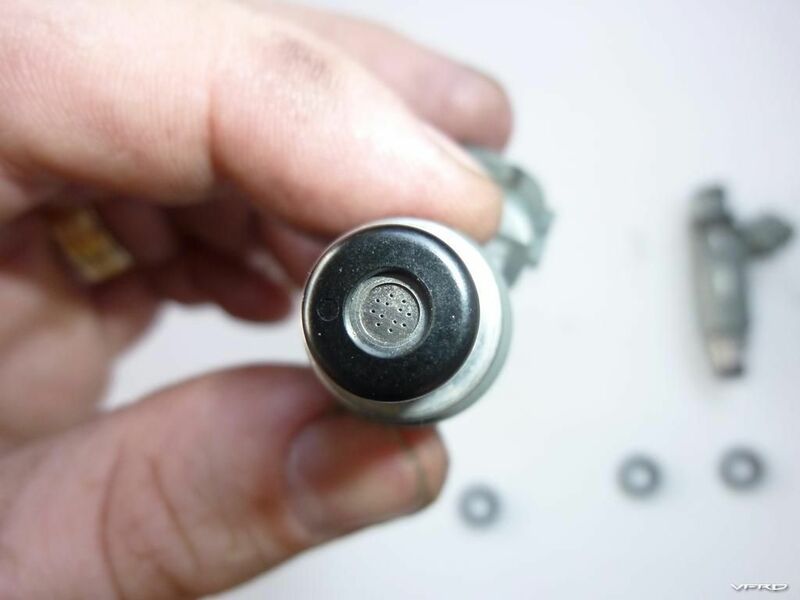 You need to pull those injectors out nice and slow so you don't lose any rubber bits down into the guts between the V of the motor, or into the motor itself! Check out the injector nozzle. On the injector, the most likely part which will need replacing is the large rubber grommet you can see here near the electrical connector. It's a dust seal, and gets crushed by the fuel rail. Mine had degraded a fair bit, but the nice injector cleaning man said he had plenty of those in his stock. When all the injectors were off, the injector cleaning guy put them on his ASNU injector diagnostics rig handily mounted in the back of his van. All he needed was some mains power, and we were off. Finally I installed the cleaned injectors back into the bike. I lightly lubed all seals and O-rings with a smidge of clean engine oil (as per industry recommendations) to ease insertion. As they say, you can never have too much lube! Clean injectors, installed and ready for the fuel rail. Update: Problems with my injectors! It turns out my injectors were corroded and cleaning them has lifted goop out of the "pits" left by the corrosion, causing leaky injectors! This is not the fault of the clean - one or more of the injectors were beyond help and living on borrowed time. 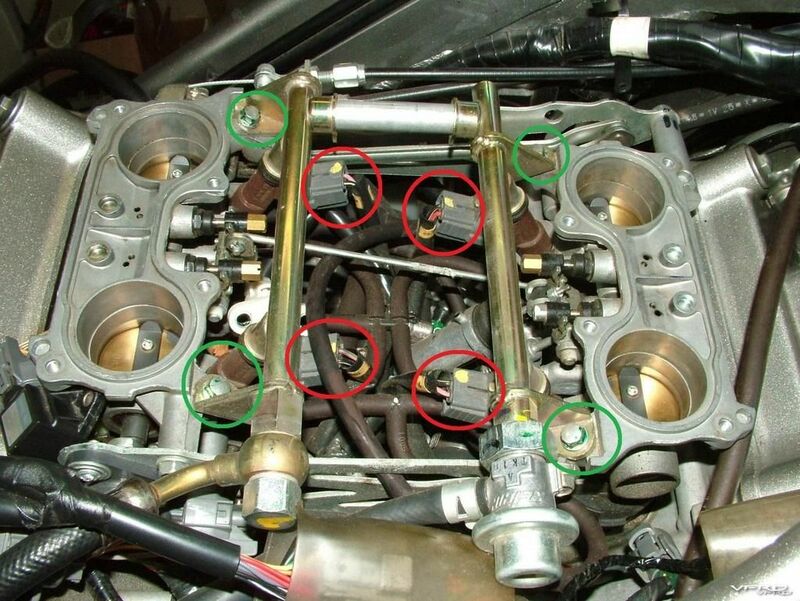 My only option was to replace my injectors with a matched set which all have the same flow rate. 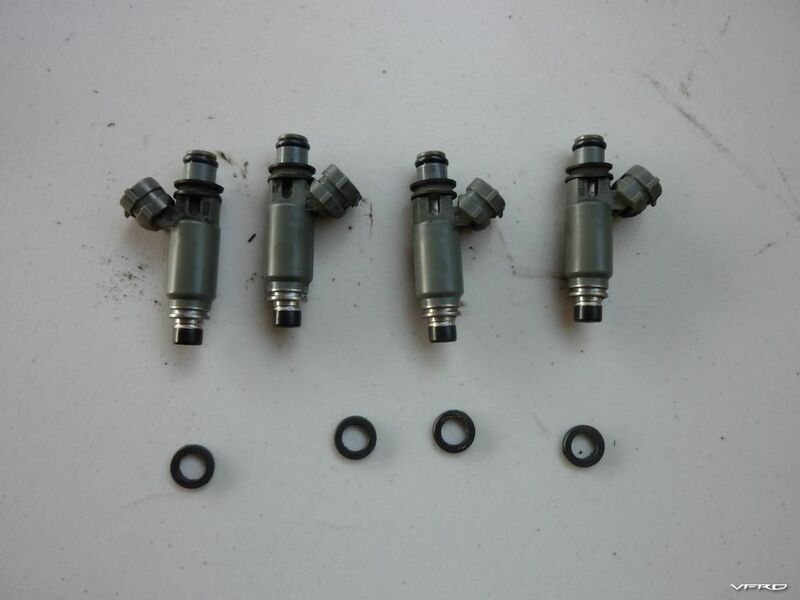 I should send off my vehicles injectors. I rebuilt the engine but cleaned the injector tips by just letting the tips sit in Sea Foam. Hmm, the manual calls them "sealer rings", and the ones just below the O-ring it calls "cushions". Anyway, when I get round to updating this post with my pics as well I'll put more corrections in. kaldek, why did you feel the need to do the "cleaning"? What fuel do you typically use? Had you tried other methods of cleaning fuel system prior to this service? If so, what? I most often use Chevron gas, and have run Seafoam and other stuff in the fuel as stabilizer and cleaner. I have a relatively high mileage 5th gen and am wondering if this sort of service is necessary. Not sure if my local Honda shop is capable but there are probably f.i. specialists who could do it. Thanks for going to the trouble of documenting the process and I hope you get some good results. I found my bike as a wrecked barn find. It had been sitting for 9 years when I bought it and my first course of action was to get it to run. After a series of tests it turned out that no fuel was getting to the cylinders so I guessed clogged injectors. My solution was to soak the entire throttle body in denatured alcohol for a week. Sure enough after the soaking and reassembly everything was like new It fired right over as if it have never been down... I did however replace the o ring seals for the injectors because I did not want any gas leak problems. Interesting. I had no idea that much gunk would get stuck in there. cleaning injectors? you do know gas is considered a solvent right? gas runs through them to run the engine so whats the difference? And yet they still plug up and have lousy spray patterns and reduced flow per minute. Huh, fancy that. It is a solvent but not everything is soluble in it. It is also a fuel that is transported, stored, and dispensed in less than ideal conditions. Picture this: it's a hot day, you've just been for a long hot ride and you pull up in your garage. You switch the engine off and walk away to go get a beer. Meanwhile the heat soak from the engine causes the fuel in your fuel rails to evaporate, leaving behind goop which turns into varnish, and clogs the injector a little bit. Repeat this over time, and add in you leaving the bike to sit over winter. 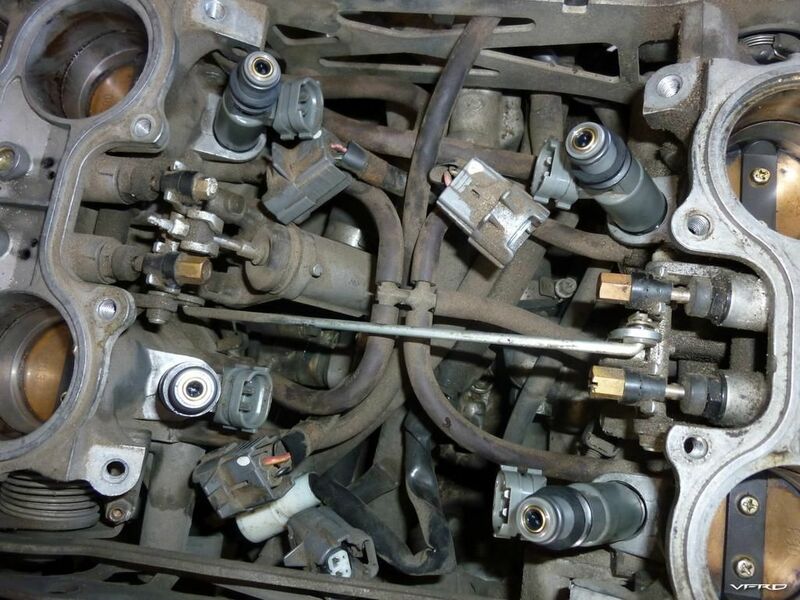 The result is an injector with a poor spray pattern, causing poor burning and reduced power, lean running and possibly pinking, and eventually engine damage. 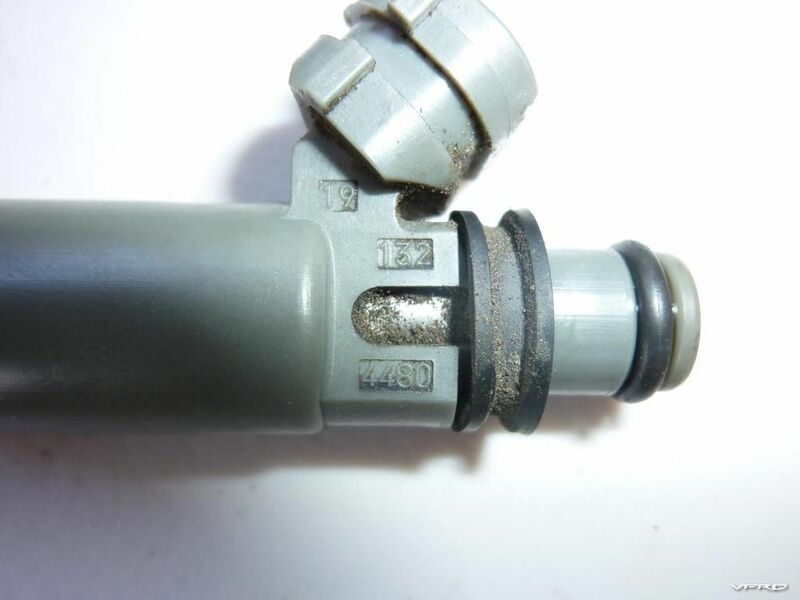 Dirty injectors cause a lot more problems than you think. One of the VFRD members had a piston melt on him not long ago from a clogged injector. Folks seem to be happy spending $20+ on repeat "injector cleaner" treatments for their bike, but aren't willing to spend $150 on a solution which actually works. Which is the better option? I know what I'd rather do from now on! 128,000 kilometres, or about 79,500 miles. Always what you would call regular 87 octane. Not really. I wasn't trying to fix a problem specifically, but rather making sure that all the farkles I just put on my bike (Powercommander V with autotune, motad headers) were able to be as effective as possible. And, that when the supercharger kit is available I'm less likely to melt pistons through clogged injectors causing lean running and excessive pre-ignition. It could well be flowing less than stock. "Necessary" is something you have to decide for yourself, but if the engine runs fine and you like the mileage you get per tank, then I would say it's not "necessary". However if you have a Powercommander with a custom tune and want the most power from your engine, your custom tune might be getting slowly worse as your already dirty injectors get dirtier. It does however mean that anyone with a custom Powercommander tune would need to go and get another custom tune done though!! Any idea if higher octane fuel will reduce the clog? here in sweden we have a minimum of 95 octane and i usually use our 98 option both on car and bike. Technically the 98 octane fuel usually contains additives which are designed to keep fuel systems clean by breaking down any collected deposits. 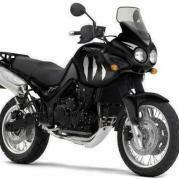 The biggest thing which affects your injector condition though is usually how often the bike is ridden. Short trips are worse, long term storage is worse. I ride my bike every day, in any weather, all year round. 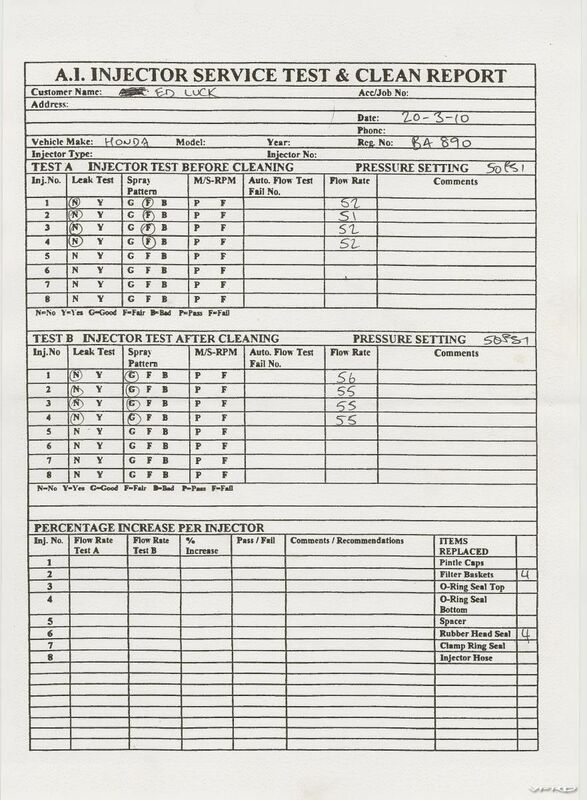 It only ever gets 91 RON (87 AKI in America), and my injectors had good spray patterns but reduced flow. I guess that means the nozzles were OK but further up inside the injector it had been restricted. Kal... am I wrong in assuming you've removed the reed valves and such?? I've only blocked them off at the moment - I have a set of PAIR valve blockoff plates coming soon. I'm gonna take a leap and say its all the crap they put in gasoline. I wonder how my bike would react to gasoline back in the day. Before all the additives and such. Anybody know how many holes are in the 5th gen injectors? One big one! Toro was saying that they clog up less than the new ones. Do you still need the powercommander now ? With the increase in fuel i would have to try it with out it. Yes, I think the Powercommander is still worthwhile. There may be spots in the fuel map where we actually want to *lean* the mixture out rather than richen it. Remember, Honda built their map for power, economy, and the environment and had to take a guess on making the map work for motors in various altitudes. A powercommander lets you tune the mixture just for power, just for economy, or heck, just for the environment if you want. And it will be correct for YOUR motor and exhaust, and air filter, and fuel you run. Add an Autotune into the mix with a custom map, and it gets even more accurate over time. 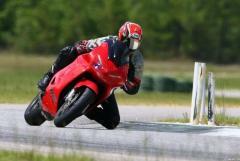 In My Garage::Silver 2003 VFR vfr two brothers exhaust and power commander. Kal, what are the implications in Oz of fitting a supercharger, from a legal and insurance point of view? Here in Noo Zilund, I don't think there'd be any legal issues, but it might make it difficult to get insurance. Good lord, I haven't gotten to the *sensible* phase yet! Legally, I can get an engineer's certificate (it's quite common). Insurance-wise I'd have to go through Shannons insurance, and probably ask for a dollar amount to be insured. They might balk when I tell them it's a daily rider though. Hmmmm. Truth be told I was thinking of going to 3rd-party cover anyway, as basically any crash and she'll be a write off. I don't think your insurance company needs to know if you are adapting the kit to a bike you already own -- it didn't come with it stock, and with most companies I've dealt with, they only care about the OEM specs of the vehicle you're covering. Now, if you purchase a motorcycle with a supercharger already on it, that's probably a different story. thanks for the write up and posting your experiences. I have a gutted cat and PCIII, any potential benefit from fitting the 12 hole injectors to a 5th gen? increased fuel atomization? better power or more economical mileage? How about adding an aftermarket fuel pressure regulator while in there?